happy sam roberts band weekend, vancouver! is there anything better than brother down? i’m gonna vote no. 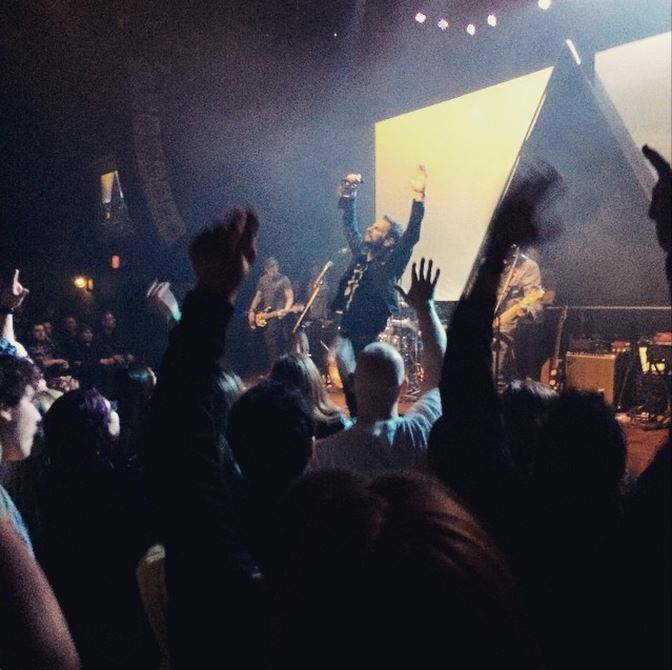 i’m also gonna vote on behalf of danielle fortier, who took this awesome photo at the town ballroom in buffalo. if you think brother down sounds best in your town, please – let’s debate. any and all nominations happily accepted. i can play this game for days. the sam roberts band will most definitely play brother down at the interior saving center – they kick off their western winter tour in kamloops tonight – before SRB weekend starts at the commodore in vancouver, and there’s nothing (NOTHING) i love more than a good SRB weekend. first, a brief recap of the last leg of the lo-fantasy tour – buffalo, toronto, and windsor. it’s brief mostly ’cause i wasn’t actually there, but let’s not get too bogged down with technicalities, because you guys are the absolute BEST, and sent me your rad stuff. i love rad stuff. 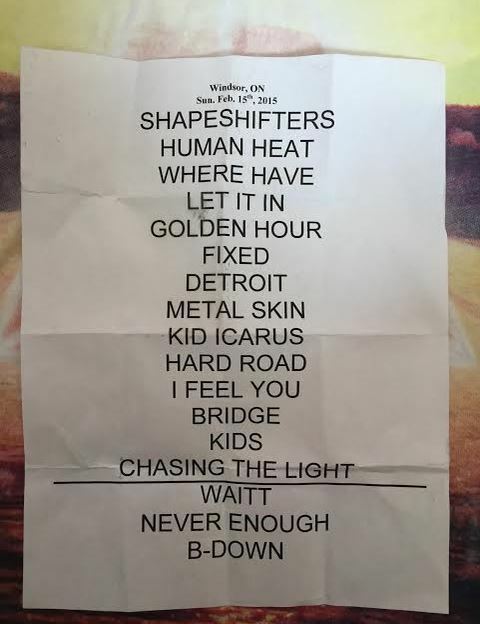 from buffalo, we’ve got both friday and saturday’s setlists from the town ballroom, and you can find those on the SRB setlist page. thank you, thank you, karen and charles!! buffalo.fm captured this pretty darn great version of the SRB’s juno-nominated we’re all in this together and @cupioproabeo shared with me via the twitter machine . . .
the SRB sold out massey hall, and the photos and reviews are as lovely as you’d hope the photos and reviews from an SRB valentine’s day show would be, complete with roses on jean jacket lapels and a surprise backstage marriage proposal. you think of everything, SRB. the next day in windsor, the world’s greatest sam roberts cover band, minotaur, played an acoustic set at dr. disc, and the SRB shook everybody’s hands and signed everybody’s stuff. it was like, minus fifty-ish that day in windsor (or something), and the place was STILL packed. iridium films captured everything right here . . .
there’s just one east coast show left before juno week starts – the SRB hit the hometown ice march 7th at the metropolis. beyond the two (2!) nominations – single of the year and rock album of the year – sam plays juno cup hockey friday, the band will sign your stuff at juno fan fare saturday, and you can see them play the juno award show sunday night. wow. whatta weekend. it’s like mmva weekend all over again, but we’ve substituted craft beer for hockey gear. if there’s anybody out there who’d like to actively juno-creep the SRB for me, please tell your people to call my people right away. this blog is a total lie. it’s the bootleg saint, and it should be the bootlegsaintS, but there’s only one bootleg saint in chemical city, and we must always respect the creative genius of sam (always). there’s two people behind this blog. first, in alphabetical order, there’s me. i’m annie. i write posts and work the twitter. there’s also brock, who handles all things technical. if the site crashes and someone’s gotta call go daddy, it’s him. i freak out about juno nominations, session ale, and sam wearing hats. brock loses his mind over arpeggios and josh. we both know all the words to everything. if you ask brock, he will tell you HE introduced ME to the sam roberts band, and he’s spread this vicious web of lies from coast to coast for over a decade now, mostly because he’s convinced himself it’s true. if you ask me, i’ll tell you the truth and swear on sam – i heard brother down first. this weekend, we’re gonna bring our battle of alberta (girls vs. boys) to vancouver to settle the score once and for all. we’ve both prepared friday night setlists, and we’ll compare these setlists to sam’s friday night setlist. the person who gets the most songs correct is obviously the person who heard the SRB first, right? right. i’m gonna channel sam now, tweak my setlist, and plan my victory party. the soundtrack? the inhuman condition, of course. here’s brother down – see you at the commodore, vancouver! This entry was posted in news, tour on February 26, 2015 by annie. soooooo! you guys! 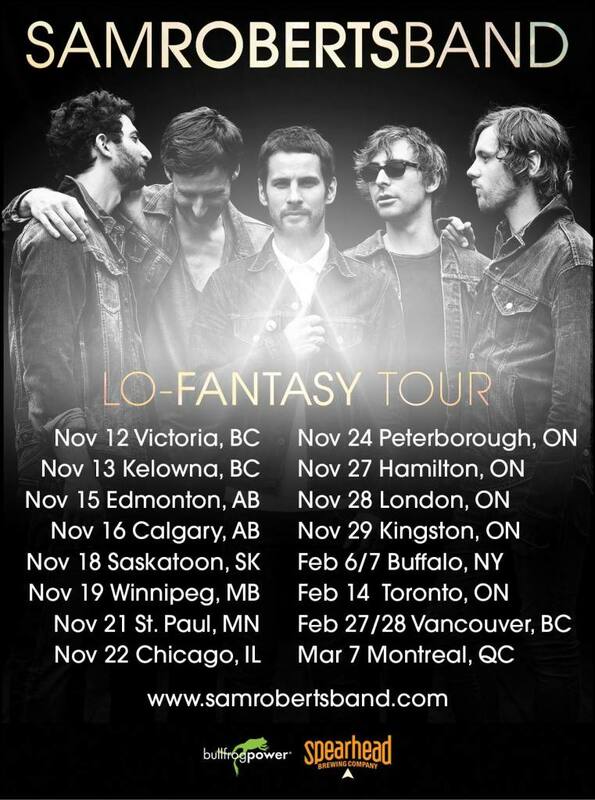 let’s pick up exactly where we left off, because the sam roberts band’s lo-fantasy tour is BACK on the road next week, and they’re gonna rock your winter blues away with two (2) SOLD OUT shows at buffalo’s town ballroom with JULY TALK. i’m not sure what’s better than a weekend of the SRB and julk talk, so i’m as jealous as ever, buffalo. first things first, before i cry ’cause i’m forever missing cool stuff in buffalo, there’s some serious business we’ve gotta address. there are super scary low-ticket warnings on the SRB’s ticketmaster page. the massey hall show on valentine’s day is almost sold out and there’s only single seats left. if you wanted to chase massey hall with windsor, head’s up – another low-ticket alert for ceasar’s the next day. on the other side of the country at the end of the month, there’s seats and GA tickets left at the interior savings centre in kamloops on february 26, BUT there’s a warning there’s only a few tickets left for friday’s show at the commodore in vancouver. saturday night at the commodore is already sold out. update! update! BOTH SRB shows at the commodore ballroom are now sold out! tickets are still available for the SRB’s hometown show march 7th at the metropolis, right before juno awards week starts a few days later. the awards will be handed out march 15th in hamilton. 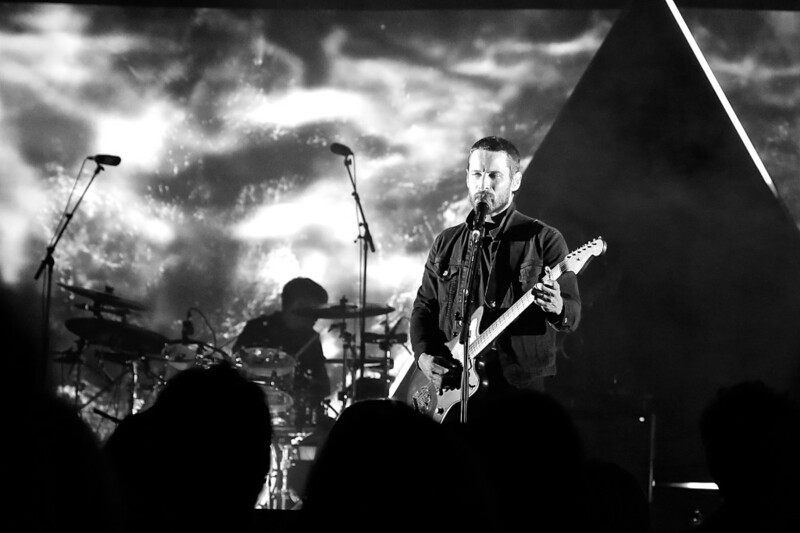 this year’s juno nominees will be announced tomorrow, and only a few performers have been announced to date, so how awesome would it be to see our beloved sam roberts band show up ALL over the place?!!? so very, very awesome. update! update! guess what!??! our beloved sam roberts band is nominated for two juno awards this year – single of the year for we’re all in this together, and rock album of the year for lo-fantasy. no word on a performance (yet). huge congrats and much love to the SRB! speaking of the SRB all over the place, OTTAWA! you LUCKY ducks! sam is hosting the NAC orchestra’s casual friday show next friday night – that’s january 30th – and he’s bringing his violin, apparently. it’s all in this metro article, and tickets start at just $25 bucks. this violin business might seem random, but it’s totally not – sam is a classically trained violinist. he’s taken lessons from the same teacher since he was a kid, and these days, it’s sunday lessons with his daughters. behold! here’s an old tweet of sam from ottawa’s music and beyond festival in 2013, violin and everything. if it seems like ottawa is kinda special when it comes to the SRB, that’s because ottawa IS kinda special when it comes to the SRB. it goes all the way back to days of brother down, and those two ottawa radio stations who decided to take a chance on a couple of songs by some guy from montreal. the rest, as they say, is a throwback for thursday. brad ferguson is a tour / production manager and live audio mixer/technician, says his twitter bio, and the list of clients on his blog reads is like my iTunes on shuffle: the arkells, the sheepdogs, hey rosetta!, big wreck, mother mother, tokyo police club, and, of course, the sam roberts band. i bet he’s got some good stories. he toured with the SRB in 2011 – the last time the SRB played massey hall – and wrote all about the massey hall shows on his blog. if you’re a super techy sound nerd, there’s a detailed post you’ll appreciate. if you’re just a fan – such a fan, even – who reads anything and everything SRB, but you aren’t exactly sure what a guy who “does the monitors” actually does, no worries – there’s a post for you, too. brad also worked on the SRB’s 2012 canada day show in surrey, bc – one of few almost-full-length SRB concert videos you’ll find on the entire internet, by the way – and the SRB’s 2011 canada day show in ottawa (with princess kate! ), and it was the best canada day ever. who can resist the SRB performing for royalty in their finest denim finery!? spoiler alert: i didn’t even try. i did, however, watch this video of ‘let it in’ a bunch of times before i read the background on brad’s blog. who knew an iPhone could sound this good? enjoy! This entry was posted in mindflood monday on January 26, 2015 by annie. 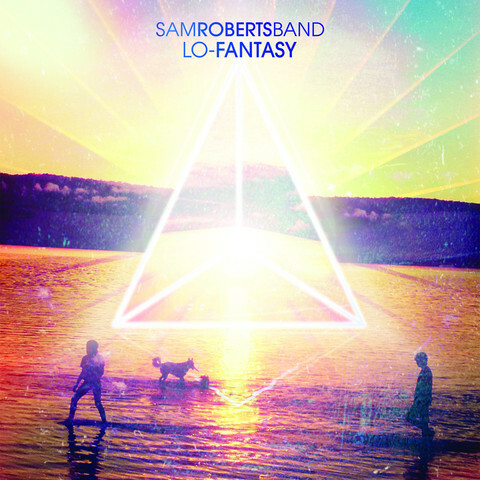 before we press play on this sam roberts band 2014 highlight reel, let’s formally crown lo-fantasy as the best of the best this year. the bold and brave evolution of the sam roberts band is “without a doubt their strongest release to date,” says cbc music, and it’s no surprise the SRB’s efforts earned them a place on best-of lists big (like muchmusic) and small (like your favourite music blogs) this year. i fan-girled the SRB so very, very hard this year, and this best-of post isn’t exhaustive so much as exhausting, because the SRB covered SO MUCH ground and accomplished SO MUCH in 2014. please note i’m not an expert (just a super fan), so if i’ve missed your SRB best-of 2014 moment PLEASE tell me, ’cause there’s literally nothing i’d rather gush about more. until then, here’s twelve months of this year’s best to start your 2015 off right. january: a televised new year’s eve niagara falls performance is a great way to kick off an album-release year, and thousands braved freezing temperatures to ring in 2014 with the SRB and fireworks at the falls. the SRB are pros when it comes to this kinda thing: eric’s gloves are fingertip-less, sam’s layers include the ever-practical and always fashionable plaid, and the horn section is wearing matching toques. FEBRUARY: the BEST month of 2014, and unsurprisingly a busy one for the SRB, who launched their masterpiece with two performances of the entire record start to finish – one at new york’s mercury lounge, and a second at montreal’s lion d’or. andrej ivanov’s scene magazine review of the montreal launch captures the spirit of an SRB show beautifully. february also included a stop in the et canada orange lounge for a six-song set (partition blues! ), a much office session with a billy idol cover, a date with strombo, and this up close and personal edge special i love so, so much. (pro tip: the edge special starts around the six-minute mark). march: the SRB headed to texas in march for the sxsw festival in austin before kicking off the western leg of their US tour in san diego. sylvia borgo of owl and bear captured the SRB at the perfectly dive-y casbah in san diego, tom dellinger of showbams described the SRB’s performance at the chapel in san franscisco as “rich and flawless,” and i took this photo of the SRB (sans james and chet) at the church on york in los angeles. if you don’t count my compulsion to hug band members within an arm’s reach (so sorry! ), the church on york is probably the closest i’ll ever get to the SRB. it’s definitely the most intimate SRB performance i’ll ever experience, unless the SRB play my living room, which probably won’t happen if i don’t get my aforementioned urges under control, so . . . never. it will never happen. praise the lord we’ll always have the church. ever watch the most-played artist in your iTunes library perform in the basement of an old church in LA, and you turn around, and there’s the second most-played artist in your iTunes library, and suddenly you’re caught in this surreal circle of awesome and you’ve got the feels SO bad you can’t express yourself without profanity? because there’s actually a word for that, and it’s HOLYF#@!MATTMAYSISHERE. if you’re keeping track of march . . . the SRB played the late nights / early mornings of sxsw (including hangs with celeb chef rachael ray who made the first move and invited the SRB to perform at her annual feedback festival just ’cause she likes human heat THAT much) . . . kidnapped the east coast’s aforementioned guitar hero in LA and held him captive long enough to make this magic in seattle . . . killed a string of western US dates, and somehow STILL found the time to record my favourite interview / performance of the year - the audiotree session. the SRB is just too good to us. april: welcome to the world, session ale! in april the SRB announced their collaboration with ontario’s spearhead brewery to create SRB session ale, and teamed up with young galaxy to create a remix of shapeshifters, releasing only six-hundred hand-numbered vinyl beauties for record store day 2014. (i got lucky number 502 at blackbyrd music in edmonton). may: the SRB laid kinda low in may, with a few shows in new york state, so here’s metal skin from CBC’s backstage pass lo-fantasy preview from february to fill our hearts until we get to june. disclaimer: this all-SRB episode of backstage pass was filmed in november and aired in february, but who cares? the SRB performed songs from lo-fantasy surrounded by a bunch of super lucky fans, and it’s preserved forever and ever on youtube for the rest of us. it’s also on my pvr, because you can never be too careful. june: if i made a list of reasons to move to toronto, one weekend in june 2014 could quite possibly seal the deal, ’cause proximity to more rad SRB stuff than my heart can possibly handle would be amazing. like a flawless qtv performance on friday, and the first of two sold-out nights at jackson triggs winery. saturday the SRB served their namesake brew at the session craft beer fest in toronto, and picked up the award for best collaboration, then played a second sold-out night at jackson triggs. sunday, the SRB performed at the muchmusic video awards and shapeshifters won the award for best rock / alternative video. july and august: the SRB dazzled thousands at festivals left, right, and center this summer, kicking things off on canada day in dartmouth, and ending in august with the SRB’s annual sell-out weekend at the kee. i loved the kee and freaked out about this year’s shows big time right here. somewhere in the middle, between canada day and the kee, the SRB headlined day two of turf in toronto, got rained out at folkfest in regina, raised funds and awareness for neuro-traumatic injuries at rockin’ wheel in ontario, played the massive squamish valley music festival in vancouver – “tailor- made” for squamish, says the vancouver sun’s francois marchand. the SRB won the heart of every man, woman, and child in tumbler ridge, bc the very next day, with a quintessentially small-town, family friendly SRB show at tumbler’s golf and country club. also . . . osheaga in montreal, festival d’ete in quebec city, and bluesfest in ottawa. the bottom line – the SRB literally rocked coast to coast this summer and AS IF you needed more proof, here’s sam and dave (aka minotaur) at the gathering,the annual festival of food and music comedian shaun majumder organizes in his hometown of burlington, newfoundland every summer. missing this wicked tear with the b’ys is most definitely my biggest live music regret of the year. 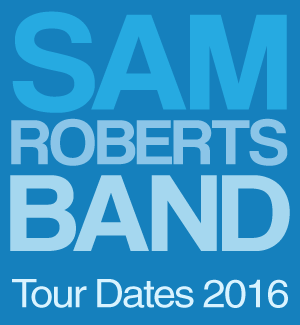 september: the sam roberts band’s annual killer weekend in cottage country. i love you, kee to bala. possibly the most refreshing and inspiring sam-cation in the history of sam-cations forever and ever, amen. if you say the kee is on your bucket list, because so many people do, MAKE THIS SUMMER YOUR YEAR already. seriously. did you hear me? because i just screamed that. i wrote lots about the kee here, and i’ve already booked off my labour day weekend 2015, because i don’t mess around. october: the SRB took their show on the road to europe in the fall, with a late september show at the garage in london before heading south to kick off their spanish tour in bilbao. according to my calculations (so, some tweets i google translated and youtube), spain loves the SRB. november: YAY! THE FIRST STRETCH OF THE OFFICIAL LO-FANTASY CANADIAN TOUR! the SRB crossed most of the country in the winter ’cause they love us THAT much. from coast to coast canadians waited (almost) patiently for the tour announcement, and the SRB rewarded us handsomely with ten shows from bc to ontario before pausing the tour for a well-deserved christmas break. if you haven’t seen this tour yet or just need to see this tour again, don’t worry – lo-fantasy hits the road again in february. 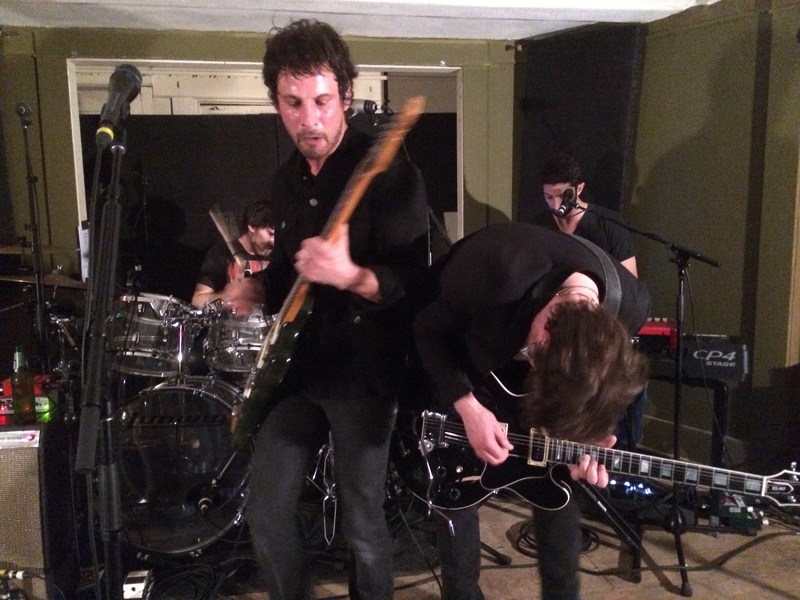 the reflector covered the SRB’s calgary show so perfectly i read their review like, four times. dwayne larson took these lovely photos of the SRB’s show in winnipeg for it’s a music thing, and this review by UBC’s phoenix newspaper covers everything you need to know about the SRB’s stop in kelowna, including the wardrobe choices of the SRB’s resident fashion plate / bass player extraordinaire james hall. i wrote about the SRB’s shows in edmonton and calgary here, and snagged this video of a rare and rad live performance of every part of me in calgary. february 2015: we’ll wrap up this best-of 2014 post with a weekend sure to make the best-of 2015 list, because it’s back-to-back shows in buffalo with july talk, so how could it not? i’m willing to bet my small (but completely normal) SRB shrine the two shows at the town ballroom on february 6th and 7th will start off next our next SRB retrospective. you’ve got like, a month-ish left, buffalo. hang tight – you’re almost there. happy new year, you guys! i hope your 2015 is full of everything you love the most. This entry was posted in news on December 31, 2014 by annie. you guys! happy holidays! 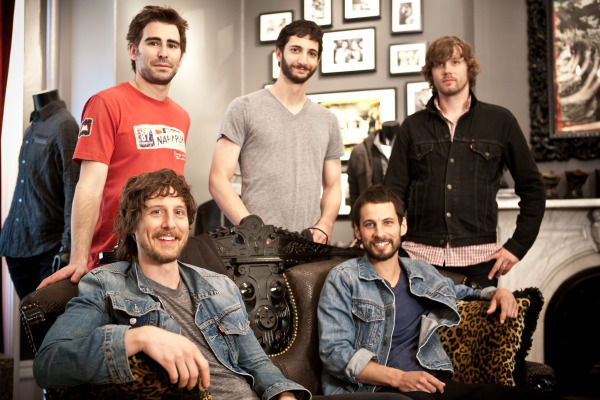 i am so glad we’re together again, gushing over our beloved sam roberts band just in time for christmas next week. are you ready?! is your tree up? presents wrapped? did you drink exactly eighteen beers from your beer advent calendar, and eat alllll the christmas cookies? i hope so. let’s start this week’s #tbt of random christmas-related SRB goodness with a gorgeous photo of sam wearing THE best winter hat ever, because it’s christmas and i love you guys. 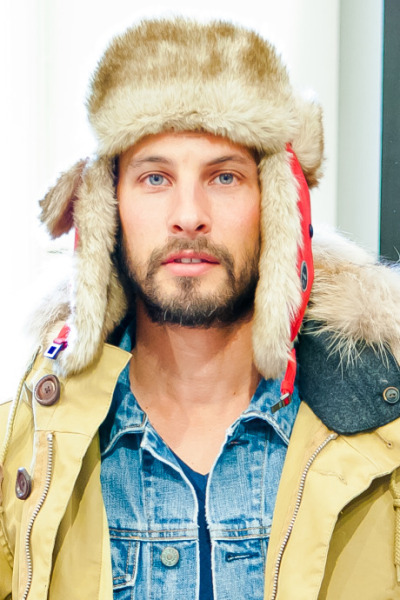 our very most favourite everyman rock star is ready for anything: a polar expedition, an SRB show at santa’s workshop, or just the runway at a john varvatos fashion show. mark elias of moxie media & design took this beautiful photo three years ago in hamilton, when he spent the day filming a press video for the american designer, and the SRB stopped by to check out john varvatos’ fall 2011 collection. when i emailed mark to ask if i could use this photo, he responded almost immediately, and later sent me a dropbox link (!?) to all the photos from the session, just because he’s an SRB fan who supports the band. a dropbox link, guys. wow. how great is mark? so very, very great. if i sent christmas cards, he would be top of the list. thank you, mark! if you’d like to see more of mark’s work, check out his website. here’s an awesome SRB group shot mark captured, because christmas is all about gluttony, and there can never be too many awesome group shots of the SRB. if you need to take a minute, please do. you’re in the right place for that kinda thing. i won’t judge. every year, quebec musician andy kim organizes a christmas concert fundraiser, and this year’s first-ever concert in montreal raised money for the starlight children’s foundation. sadly, i couldn’t find any videos of sam’s recent appearance with andy, but keep your fingers festively crossed they’ll be posted by this time next year. until then, here’s a video from the 2011 show in toronto. don’t walk away eileen becomes feliz navidad – total christmas magic. last and most definitely not least, here’s a 2009 video of sam and friends – including kathleen edwards, dallas green, ron maclean, and the SRB’s very own james hall – performing the gambler at the holiday jam benefit for the sick kids hospital in toronto. because your brain can only process so much awesome at once, i’ll point out sam’s incredible fringe jacket and cowboy hat now, ’cause this video also features an appearance from an especially lovely dave nugent (wearing a dress). merry christmas, everybody!!! Sam Roberts performs the Gambler from NOW Magazine on Vimeo. This entry was posted in #tbt on December 18, 2014 by annie.